Getting approved for a credit card when you have no credit is tough. Many credit cards require you to have an established credit history before you can be approved, but you can’t establish a credit history if you can’t get approved. Thankfully, there are a handful of good credit cards that allow you to start building your credit even without a previous credit history – some even offer credit card rewards. Student credit cards and secured credit cards are two of the best credit cards for no credit. We’ve included some other options for non-students and those who prefer to skip the security deposit. So read on and find out the best credit cards to get if you don't have any credit. Don’t worry if you start out with a low credit limit – which is normal when you get a credit card with no credit. Capital One will automatically consider you for a credit limit increase if you make your first five monthly payments on time. The APR is pretty steep on this credit card, so pay your balance in full each month to avoid expensive interest charges and to avoid negating your rewards. 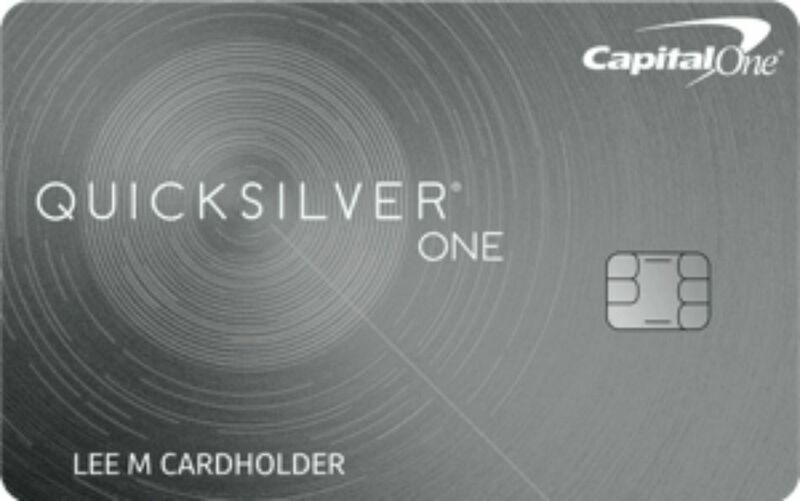 The Capital One QuicksilverOne comes with a few additional MasterCard benefits, including extended warranty for items you purchase on your card, auto rental insurance, and travel accident insurance. Important Pricing: The APR is 26.96% and the annual fee is $39. The Capital One Platinum doesn’t have a lot of frills and extras – it does have a reputation for approving consumers who are just starting out with credit. Capital One’s website has dozens of user-submitted reviews from applicants who were approved despite having no credit history. Just make sure you have an income before applying. Like Capital One’s other credit cards, you’ll automatically be considered for a credit limit increase if you make your first five monthly payments on time. And because of the steep APR, you’ll want to pay your balance in full each month to avoid paying expensive interest on your credit card balance. Important Pricing: The APR is 26.96% and there is no annual fee. View details about this ​credit card. Even though you’re making a security deposit as collateral for your credit limit, most secured credit cards still do a credit check. The OpenSky Secured Visa is the exception. This secured credit card doesn’t require a credit check, which makes it much easier to get approved for. You can open an OpenSky Secured Visa with a security deposit between $200 to $3,000, which you can make by debit card, wire transfer to Capital Bank, Western Union, or by mailing a check or money order. These options are ideal for those who don’t have a traditional checking account. Your credit history will be reported to the three major credit bureaus, which means you can begin building good credit as long as you make your payments on time and keep a reasonable credit card balance. Unlike most other secured credit cards, your card won’t be converted to an unsecured credit card. However, once you’ve started building credit, you may be able to qualify for an unsecured credit card. Important Pricing: The APR is 19.64% and the annual fee is $35. The Discover it Secured Credit Card is a secured credit card with extra perks. Your purchases earn cash back rewards that you can redeem for a statement credit to your account. Earn 2% cash back at a restaurant or gas station on up to $1,000 in combined purchases in those categories each quarter. All your other purchases will earn 1% flat cash back. Keep your card open for a full year and Discover will automatically match all the cash back you earn in your first year. A minimum $200 security deposit is required to open up your credit card. Once your account has been open for eight months, Discover will consider converting your account to an unsecured credit card. You’ll receive a refund of your security deposit and keep your credit limit. Because of this benefit, it may be a good idea to make a larger security deposit for a higher credit limit. Discover includes a free FICO score with your monthly billing statements, so you’ll be able to see how your credit card usage is helping your credit score. Important Pricing: The APR is 24.99% and there is no annual fee. Student credit cards are a good option for those with no credit. Credit card issuers may ask for proof of enrollment before approving you for a credit card – so make sure you’re a student before applying. The Discover it Student Cash Back credit card pays 5% cash back on purchases in categories that rotate each quarter and 1% back on everything else. Just like you have to sign up for classes, you must sign up to earn the 5% cash back in the bonus categories. Enroll before the beginning of the quarter to ensure access to the bonus all quarter long. Keep your card active and in good standing, and at the end of your first year, Discover will match all the cash back you’ve earned at the end of your first year. You can also earn $20 cash back bonus each school year for the next five years if you keep your GPA at a 3.0 or higher. Important Pricing: There’s no annual fee. Enjoy a 0% introductory APR on purchases and 10.99% on balance transfers for the first six months. After that, the regular APR is 14.99% to 23.99%. Students who want to earn rewards to use for spring break, summer vacation, or to offset the cost of trips home will enjoy the Bank of America Travel Rewards for Student. The card pays 1.5 points for every dollar in purchases you make on the card. And, you can jump-start your rewards by earning 25,000 bonus points if you spend $1,000 on purchases within the first 90 days of opening your account. The bonus is worth a $250 statement credit that you can use toward travel purchases on your card. You can earn a 10% bonus on your rewards if you also have a Bank of America checking or savings account. You’ll also get free access to your FICO score, which gives you a chance to see how your credit score improves with responsible credit card use. Important Pricing: Enjoy a 0% introductory interest rate on purchases for the first 12 billing cycles. After that, the regular APR is 16.99% to 24.99%. The Deserve Edu MasterCard is great for immigrants and permanent residents who don’t have a social security number (you don't need one to be approved). Once you’re approved, the Deserve Edu MasterCard will pay 1% unlimited cash back on all purchases made on the credit card. Students also get a credit limit of up to $5,000. After using the Deserve Edu MasterCard wisely, you may become eligible for the Deserve Pro MasterCard. This upgraded pays 3% cash back on travel and entertainment, 2% back on restaurants, and 1% back on all other purchases. Important Pricing: The APR for the Deserve Edu MasterCard is 20.74%.